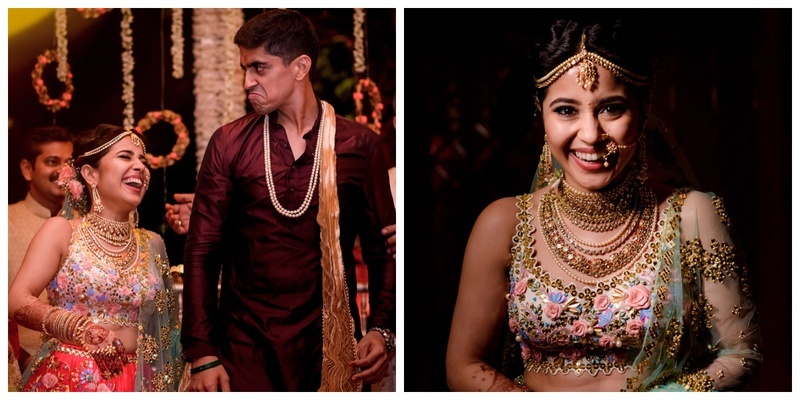 These Exclusive pictures from Shweta Tripathi and Chaitanya Sharma's quirky wedding will be the best thing you see today! Indian weddings have a penchant for being super royal and elegant, year round. That’s why, when a wedding comes up that celebrates quirkiness and off beat colors, I pay attention! Remember the #GoCheetahGetBatata wedding? Well, how can you not!! Shweta Tripathi and Chaitanya Sharma had the chillest and quirkiest wedding of the year in Goa afterall. Cherry on top, it was photographed by India’s top wedding photographer Joseph Radhik and designed by none other than Devika Narain herself. What broke the internet and instantly grabbed my attention was Shweta Tripathi’s offbeat wedding lehenga. It was designed by none other than Shubhika of Papa Don’t Preach and was a vision to behold. Although as offbeat as it looked, the design process was completely never-done-before too. Shubhika explains, “Shweta asked for completely out-of-the box embroidery that I would have never thought of in my dreams. This lehenga has embroidery and embellishments that I don’t usually do on a bridal outfit, but there we were - she giving her inputs and me creating something that I haven't yet! The lehenga was designed in stages. First we designed the lehenga skirt where we sat down and decided all the motifs to go in it, then the blouse was designed and then the dupatta.” Well, that’s one really offbeat way to design a lehenga I say. Okay, we’ve heard of off beat phoolon ki chaddar but to do away with it completely and replace them with balloons????? It really doesn't get cuter than this! Left you mesmerised with a smile on your face right? If you are looking for a chilled out wedding with no-drama involved, I say def take cues from this wedding!